NEW DELHI–Boeing Co. appears set to get about $2.4 billion in military contracts from India, with a senior official saying that the country’s the U.S. company’s Chinook and Apache helicopters, and that commercial negotiations will begin soon. India plans to buy a total of 15 Chinook CH-47F heavy-lift helicopters and 22 AH-64D Block III Apache helicopters, the official said. Apache helicopters at the Kandahar air field in Afghanistan. He added that Boeing’s twin-rotor Chinook was chosen recently as the preferred bidder over Russia-based MiL Moscow Helicopter Plant’s Mi-26, while the Apache was selected over the Mi-28. Another person familiar with the matter said the Chinook deal is likely to be worth about $1.0 billion and the Apache contract around $1.4 billion. The potential deals will mark a major shift for India toward diversifying its defense purchases and moving away from its decades-long reliance on Russia. India already operates Mi-26 helicopters. “Selection depends on the requirements that have been projected and whether that particular helicopter meets those requirements in the present and future scenarios,” the Indian Air Force official said. He said the acquisition as well as the lifecycle costs of the helicopters were considered carefully before taking a final decision. The commercial discussions with Boeing may take three to six months, he added. An official at the Russian embassy in New Delhi confirmed that the Indian government has chosen the Apache and the Chinook. The person added, however, that Moscow believes that there may still be room for the Indian government to reconsider its decision for the Chinook, saying that the Mi-26 is better suited for the Indian Air Force. The person added that the embassy hasn’t yet received any official note on the decision from India’s defense ministry. U.S. military sales to India have been rising in recent years, helped by growing diplomatic relations between the two democracies and by India’s push to replace its aging Soviet-vintage equipment as neighbors Pakistan and China expand their military capabilities. New Delhi plans to spend about 1.93 trillion rupees ($36 billion) on defense in the financial year through March 2013–an increase of 13% from last year. It has earmarked 795.79 billion rupees to buy new weapons. Air Marshal R.K. Sharma, deputy chief of the Indian Air Force, said in September that 2 trillion rupees ($37 billion) will be spent in the next two decades ending March 31, 2022, to purchase new equipment. He said that about $4 billion worth of deals have already been signed. India is currently in discussions also with France’s Dassault Aviation SA AM.FR +0.78% to purchase 126 Rafale combat planes for an estimated $12 billion. 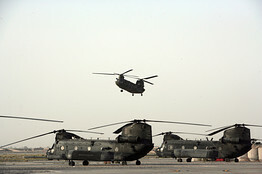 For the proposed Boeing helicopter orders, the person familiar with the matter said that the Chinooks will be bought directly from Boeing but the Apache contract will have to go through the foreign military sales route–a government-to-government mechanism for selling U.S. defense equipment wherein the purchaser deals with the U.S. government instead of the military contractor. Earlier this year, India’s defense ministry approved a proposal to purchase 145 of the 155-millimeter, 39-caliber towed artillery guns from the unit of U.K.-based BAE Systems PLC. Posted on January 7, 2013, in Uncategorized. Bookmark the permalink. Leave a comment.